If we can learn one thing from Superstorm Sandy, it's that we ignore climate change at our own peril. The first horseman was named Al Qaeda in Manhattan, and it came as a message on September 11, 2001: that our meddling in the Middle East had sown rage and funded madness. We had meddled because of imperial ambition and because of oil, the black gold that fueled most of our machines and our largest corporations and too many of our politicians. The second horseman came not quite four years later. It was named Katrina, and this one too delivered a warning. Katrina’s message was that we needed to face the dangers we had turned our back on when the country became obsessed with terrorism: failing infrastructure, institutional rot, racial divides, and poverty. And larger than any of these was the climate—the heating oceans breeding stronger storms, melting the ice and raising the sea level, breaking the patterns of the weather we had always had into sharp shards: burning and dying forests, floods, droughts, heat waves in January, freak blizzards, sudden oscillations, acidifying oceans. The third horseman came in October of 2008: it was named Wall Street, and when that horseman stumbled and collapsed, we were reminded that it had always been a predator, and all that had changed was the scale—of deregulation, of greed, of recklessness, of amorality about homes and lives being casually trashed to profit the already wealthy. And the fourth horseman has arrived on schedule. We called it Sandy, and it came to tell us we should have listened harder when the first, second, and third disasters showed up. This storm’s name shouldn’t be Sandy—though that means we’ve run through the alphabet all the way up to S this hurricane season, way past brutal Isaac in August—it should be Climate Change. If each catastrophe came with a message, then this one’s was that global warming’s here, that the old rules don’t apply, and that not doing anything about it for the past 30 years is going to prove far, far more expensive than doing something would have been. If you wanted, you could even add a fifth horseman, a fifth disaster to our list, the blowout of the BP well in the Gulf of Mexico in the spring of 2010; cost-cutting on equipment ended eleven lives and contaminated a region dense with wildlife and fishing families and hundreds of thousands of others. It was as horrendous as the other four, but it took fewer lives directly and it should have but didn't produce political change. Each of the other catastrophes has redirected American politics and policy in profound ways. 9/11 brought us close to dictatorship, until Katrina corrected course by discrediting the Bush administration and putting poverty and racism, if not climate change, back on the agenda. Wall Street's implosion was the 2008 October Surprise that made Americans leave Republican presidential candidate John McCain's no-change campaign in the dust—and that, three years later, prompted the birth of Occupy Wall Street. The Wall Street collapse did a lot for Barack Obama, too, and just in time another October surprise has made Romney look venal, clueless, and irrelevant. Disaster has been good to Obama—Katrina’s reminder about race may have laid the groundwork for his presidential bid, and the financial implosion in the middle of the presidential campaign, as well as John McCain’s disastrous response to it, may have won him the last election. The storm that broke the media narrative of an ascending Romney gave Obama the nonpartisan moment of solidarity he always longed for—including the loving arms of New Jersey Governor Chris Christie. But it’s not about the president; it’s about the other seven billion of us and the rest of the Earth’s creatures, from plankton to pikas. Maybe Sandy will also remind us that terrorism was among the least common, if most dramatic, of the dangers we faced then and face now. Though rollercoasters in the surf and cities under water have their own drama—and so does seawater rushing into the pit at Ground Zero. A stranger sent me a widely circulated photograph of a front gate in Hoboken with a power strip and extension cord and a little note that reads, “We have power! Please feel free to charge your phone.” We have power, and volunteers are putting it to work in ways that count. In many disasters, government and big bureaucratic relief organizations take time to get it together or they allocate aid in less than ideal ways. The most crucial early work is often done by those on the ground, by the neighbors, by civil society—and word, as last week ended, was that the government wasn’t always doing it adequately. Amazing and inspiring work by community and Occupy folks! Hot nutritious meals for many hundreds. Supplies that people need, like diapers, baby wipes, flashlights etc., all organized. Also saw the first (meaning first set up in NYC—only tonight) scary FEMA site a few blocks away. Militarized and policed entrance, to an area fenced in with 15-foot fences, where one gets a sort of military/astronaut ration with explanations of how to use in English that I did not understand. Plus Skittles? When Occupy first began, all those tents, medical clinics, and community kitchens in the encampments reminded me of the aftermath of an earthquake. The occupiers looked like disaster survivors—and in a sense they were, though the disaster they had survived was called the economy and its impacts are usually remarkably invisible. Sandy is also an economic disaster: unlimited release of carbon into the atmosphere is very expensive and will get more so. Disasters often unfold a little like revolutions. They create a tremendous rupture with the past. Today has nothing much in common with yesterday—in how the system works or doesn’t, in what people have in common, in how they see their priorities and possibilities. The people in power are often most interested in returning to yesterday, because the status quo was working for them—though Mayor Bloomberg is to be commended for taking the storm as a wake-up call to do more about climate change. For the rest of us, after such a disaster, sometimes the status quo doesn’t look so good. 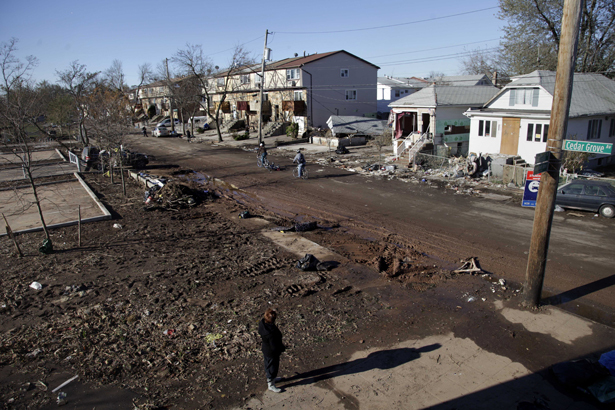 For more on the significance of Sandy, check out Naomi Klein's latest, "Superstorm Sandy—A People's Shock?"